The former Newcastle Railway Station is a significant component of the Revitalising Newcastle program and an important state heritage listed building located in Newcastle’s east end. Following extensive community consultation, significant heritage restoration works, repairs, and the filling of areas between the former platforms - 'The Station' as it is now known, is seeing a new lease of life. HCCDC is committed to activating The Station until it's end use is identified in 2020. During the sites temporary activation, the ground floor spaces and platform areas will become a place for community to gather and enjoy events as well as a variety of other activities and offerings. Restoration of the public areas of The Station precinct was completed by HCCDC in 2018 allowing for the temporary activation of the site. & opening spaces on the ground floor. Newcastle Station is an example of Victorian Italianate architecture. The first station was built around 1858 as a small brick building with a single platform. As Newcastle grew, the original station quickly became inadequate and a new, two-storey station was built in 1878. It included a verandah along the Scott Street frontage that was later closed in. The current awning along platform one was built around 1897 and additional buildings were established in the late 1800s. The gas retort building and associated gas tanks on the northern side of the station were constructed in 1883 to provide the station with gas. Newcastle was the only regional station with a silver service dining room for passengers, and the spaces for the dining room and upstairs kitchen, including a dumbwaiter, are still visible. In the 1920s the station was extended. Original plans included an L-shaped, two-storey wing along Watt and Scott Streets, with a three-storey tower on the corner where the streets meet. However with no funding to construct the proposed works, a smaller extension was constructed followed by a building on the corner of Watt and Scott Streets used for rail administration. The building and surrounding grounds between Scott Street, Watt Street and Wharf Road make up the Newcastle Station precinct. Comprehensive community engagement was undertaken to establish a clear understanding of how people would most like to use the station precinct and see it restored. Through the 2016 Ideas Festival community engagement program, the community was asked for its thoughts on the future of the space. Over 1,500 comments were received, consisting of 146 unique ideas. & cinema under the stars. In consideration with the community feedback, HCCDC performed significant platform infill and heritage restoration works at the precinct, and took the site to market for a temporary 18-month lease in late 2017 to see how The Station could be used by the community. Following the Ideas Festival in 2016, and a competitive EOI process in 2017, Renew Newcastle was selected to run temporary activation of The Station. HCCDC took over The Station's activation after Renew Newcastle wrapped up as an organisation in March 2019, and has aspirations for the site to deliver community events, destinational offerings and celebrate heritage. The Flyer is an interactive interpretation of the iconic Newcastle Flyer express steam train that ran between Newcastle and Sydney from 1929 until 1970. 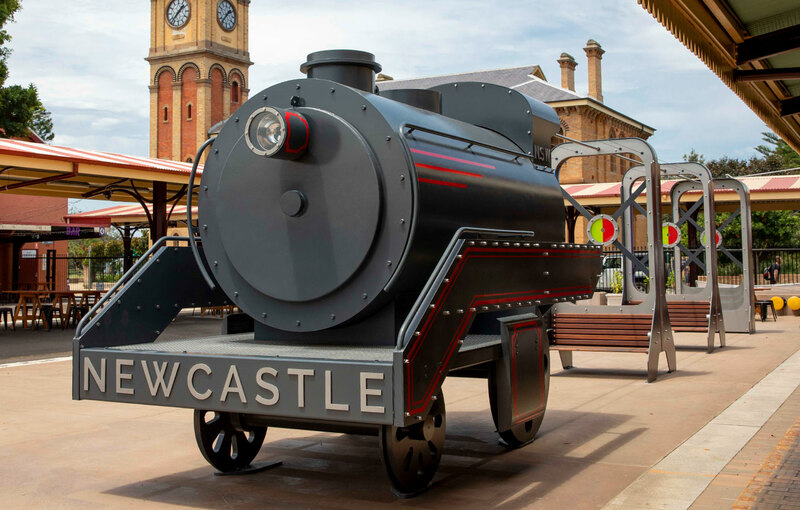 The public art installation displayed on the former Newcastle Railway Station platform can be appreciated by families and rail enthusiasts alike - with lighting, interactive sounds and train-style seating as a tribute to the special service The Flyer provided for the people of the region. The artist behind the project, David Cianci, and the Artscape team scoured transport records and spoke to people familiar with the Flyer service for inspiration to draw out the essence of the mighty 38 Class locomotive. The team invested over 500 hours into the Flyer’s design process, and over 1000 hours into fabrication and assembly - a project made possible thanks to Newcastle Port Community Contribution funding.